Lonny Huner, left, and Ben Rupp planted one of four royal raindrop crabapple trees Tuesday in memory of Perry Rupp. The former Clinton Township trustee and Fulton County Commissioner died July 22. The trees were planted at the corner of Linfoot Street and Glenwood Avenue in Wauseon by members of the Rupp family, including his wife, Jana, and their friends. The site will include a memorial marker. 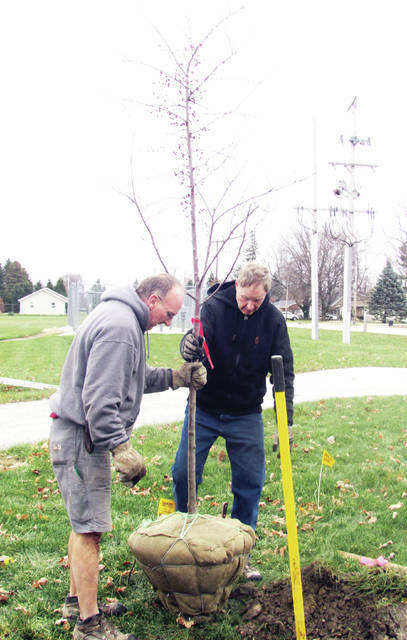 https://www.fcnews.org/wp-content/uploads/sites/45/2018/12/web1_rupp-memorial-tree.jpgLonny Huner, left, and Ben Rupp planted one of four royal raindrop crabapple trees Tuesday in memory of Perry Rupp. The former Clinton Township trustee and Fulton County Commissioner died July 22. The trees were planted at the corner of Linfoot Street and Glenwood Avenue in Wauseon by members of the Rupp family, including his wife, Jana, and their friends. The site will include a memorial marker.